In order to increase conversion on ModCloth's mobile site, I spent much of my time at ModCloth optimizing the mobile site. The goal was to create feature parity across devices and continue mobile first design and development. I analyzed and reviewed the current mobile site and found points for improvement. One problem to solve was giving the user a way to browse any category from any page. I solved this by designing a global header and global navigation through a slideout with expandable categories. In addition, I designed a simplified Join/Sign In modal and page to increase registration. I started off by rethinking the information architecture of our existing site and proposed a new site map to build the mobile site off of. I also being sketching ideas for core feature ares such as navigation. Another major area was redesigning the reviews experiences. We wanted to make it easy for users to consume the reviews and scan content to find exactly what they were looking for. Users found it important to be able to glance at images as well as the reviewers body measurements. By scanning the body measurements, users could find reviewers who were similar to them and then dive into exactly what that user said. Early on, I also wireframed the loving and sharing features from the product description pages. I worked closely with a visual designer to come up with a style guide and components that could work across the new mobile site. 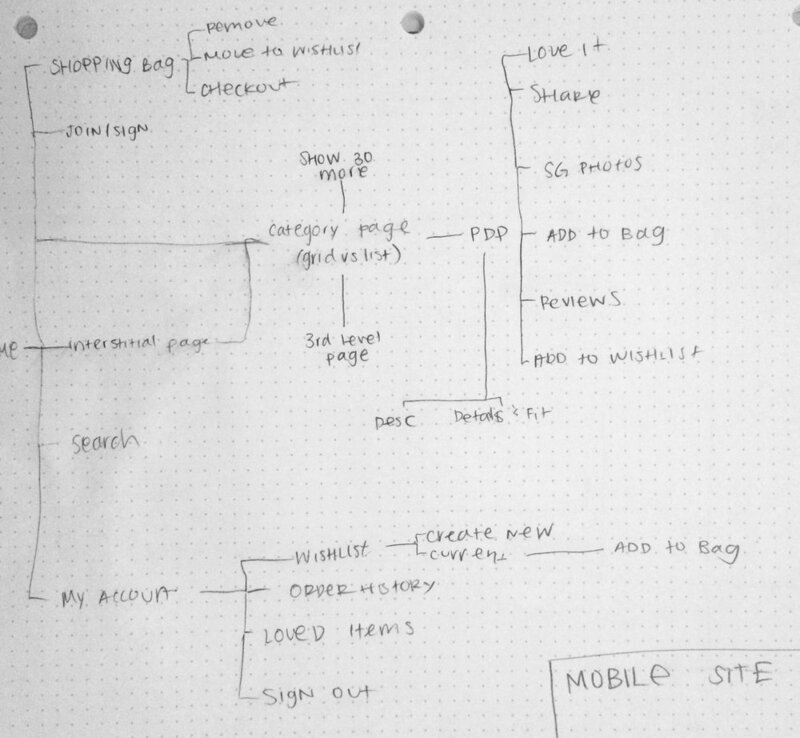 Then I applied the visual design to all of my wireframes for the mobile site.